Blue and yellow Vote yes to remain in Europe badge. 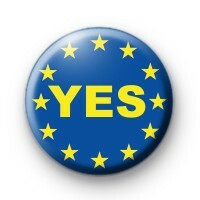 This 1 inch pin badge with YES written inside the EU Flag is perfect if you are voting in the British EU referendum to stay in the European Union. We at Kool Badges will be voting to stay in the EU as we have thousands of regular customers in Europe. Are you voting yes in the upcoming European Referendum? Do you want Britain to remain in the EU? If so be sure to buy some of these hand made Vote Yes EU referendum badges. Standard 25mm button badge hand made in our UK workshop. Vote against BREXIT.